A hypothetical case of subacute cutaneous lupus erythematosus (SCLE) will be presented and discussed to illustrate the author’s approach to diagnosis and management of complex medical dermatology problems involving rheumatologic diseases. The case discussion will involve three different time points in the patient’s disease course to illustrate key elements of the initial evaluation and diagnosis of such patients, the recognition and management of adverse effects of treatment, and the management of disease complications resulting from the development of overlapping autoimmune disorders during a patient’s disease course. 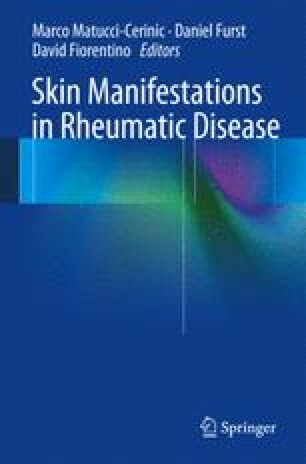 The author’s understanding of the diagnosis and management of rheumatologic skin disorders was built up on a foundation of knowledge and experience that was shared with him by several more senior American academic dermatologists. Those individuals include James N. Gilliam (deceased), Thomas T. Provost (deceased), Denny L. Tuffanelli (deceased), Sam L. Moschella, and Irwin M. Braverman. Several of these individuals served as mentors to the author providing him with instrumental career development guidance. The author will be eternally grateful for the support these individuals provided to him and the contributions they as a group made to our modern understanding of rheumatologic skin disease.